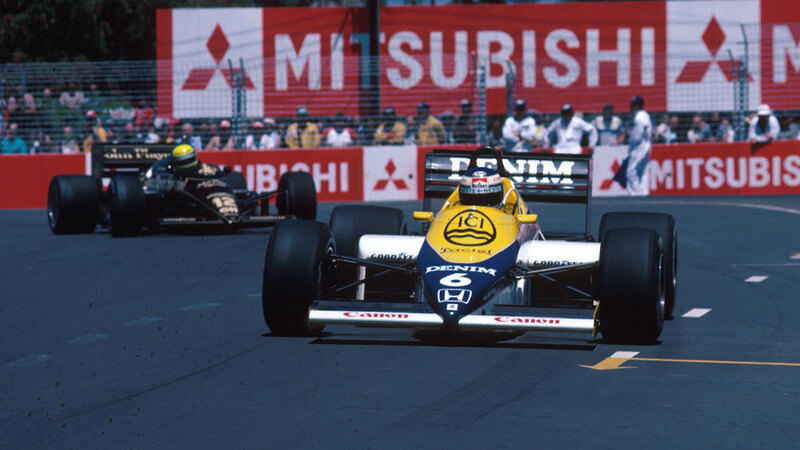 The 16th and final round of the season took place on the new street circuit in Adelaide and was won by Keke Rosberg on his final outing for Williams before moving to McLaren. It was the fifth and as it turned out last F1 victory of his career. The tree-lined course was widely applauded by drivers and the media but was hard on the cars - only eight were classified. The in-form Nigel Mansell, buoyed by back-to-back wins at Brands Hatch and Kyalami, was on the front row of the grid behind Ayrton Senna (his seventh pole of which only one had been converted to a win, a sign of the speed but frustrating unreliability of his Lotus). Mansell started quicker but was almost immediately re-passed by Senna in a move which left Mansell fuming (post-race he branded the Brazilian "a total idiot" who would "kill himself if he drives like that"). After three laps he retired with three teeth stripped off the car's crownwheel and headed for the airport still steaming. Senna's move on Mansell had delayed him and allowed Rosberg to nip by and control the pace, his Williams running on cast-iron brake discs which were stronger than the carbon-fibre ones used by Senna and others. Senna did catch Rosberg but only succeeded in clipping the back of the Williams on lap 42 when Rosberg slowed (Senna subsequently claimed the Finn had braked deliberately, Rosberg responding he was unaware he had even been hit) and pitted for tyres. Senna had a wild ride as he slid off the road, bounced over the grass and kerbs and launched himself back onto the road. He pitted a lap later for tyres, a new nosecone and a clear out of debris from radiators and he rejoined third. He took second from Niki Lauda, in his final F1 appearance, on lap 50 and regained the lead when Rosberg stopped for a second set of tyres three laps later. When Senna's tyres lost their edge on lap 56, Lauda moved back into the lead but he locked his rear brakes and spun into a wall and also into retirement. "It's time to grow up," Lauda said. "I will now start some sensible work." That left Senna again leading Rosberg but a puff of smoke announced the death of the Lotus' Renault engine. Senna was out and Rosberg was through to win, but there was still drama. Misreading signals from his pits and believing he was being caught by another car, Philippe Streiff tried to overtake his slower-moving Ligier team-mate Jacques Laffite for second place but hit the back of his car. As a result, Streiff's front wheel axle was severely damaged. But with fourth-placed Ivan Capelli, in his second race, a lap down in his Tyrrell, Streiff managed to limp home to claim a career-best third, his damaged wheel falling off seconds after he crossed the line.